DEARBORN, MI: Ford Motor Company is promoting an online documentary it produced about breast cancer survivors to raise awareness of its "Warriors in Pink" program. DEARBORN, MI: Ford Motor Company is promoting an online documentary it produced about breast cancer survivors to raise awareness of its “Warriors in Pink” program. The film, titled Bang the Drum: Living Out Loud in the Face of Breast Cancer, features personal stories from Ford's “Models of Courage,” a group of 11 breast cancer survivors that represents Warriors in Pink. Ford unveiled the documentary on the Warriors in Pink website FordCares.com on October 1 to coincide with the start of National Breast Cancer Awareness Month. The goal of the documentary is to create an emotional connection with viewers and showcase ways for people to help in the fight against breast cancer, said Tracy Magee, primary brand experiential marketing manager at Ford. Ford has reached out to print, broadcast, and local media, including health, lifestyle, and women's outlets. Social and digital media will also play a significant role in the campaign, said Marisa Bradley, consumer media communications manager at Ford. The company has posted about the documentary on Warriors in Pink's Facebook and Twitter accounts, as well as Ford's main social media pages. Havas PR, which rebranded from Euro RSCG Worldwide PR last month, is assisting Ford's internal communications team with PR on the effort. Ford hired the agency last year to support Warriors in Pink. Creative agency and production company Flow Nonfiction began filming the documentary in March, when Ford introduced the Models of Courage. The film will remain online year-round, said Magee. 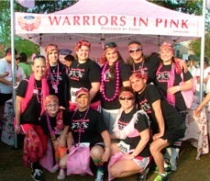 Launched in 2006, Warriors in Pink raises awareness and funds for the fight against breast cancer. Ford has supported the cause for 18 years and raised more than $115 million to help fight the disease.